Etac Aktiv Reacher - 450mm. Made to the very highest standards of quality this 450mm (18") long Etac Aktiv Reacher is part of the Etac reacher range which has been designed with an ergonomic handle that makes reaching and gripping easier for people who have a restricted reach or arm or hand mobility issues. A unique feature of the reacher is its jaws that can be turned 90° meaning they can be set, and used, horizontally or vertically without the user having to turn their arm avoiding unnecessary straining. The jaws open wide for large objects but still retain incredible dexterity to pick up smaller items. Furthermore, the gripping surface is coated with hardwearing rubber ensuring plenty of friction which also reduces the amount of strength required to open the jaws. The Etac Aktiv Reacher's trigger is slightly angled for a longer reach and is operated by four fingers rather than one so that less strength is required to grab objects. A magnet is conveniently built into the handle enabling the user to retrieve small metal objects such as safety pins or buttons. 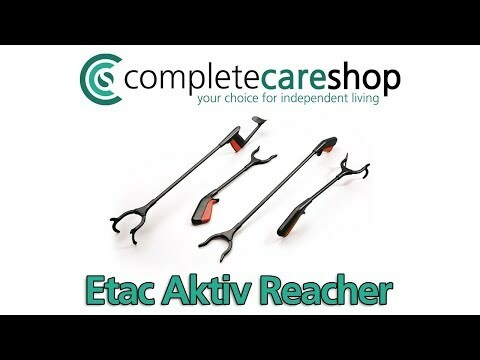 All the Etac Aktiv Reachers are available to buy in this section of the shop.